Recent years have seen a rapid expansion of empirical and theoretical studies in connectomics – the emerging science of structural and functional brain networks. 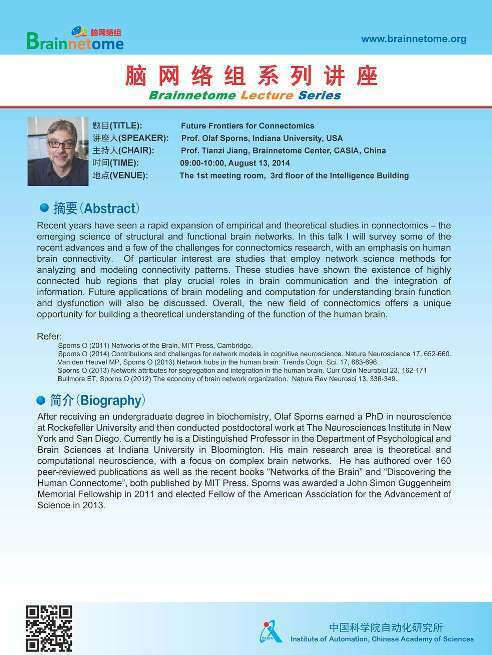 In this talk I will survey some of the recent advances and a few of the challenges for connectomics research, with an emphasis on human brain connectivity. Of particular interest are studies that employ network science methods for analyzing and modeling connectivity patterns. These studies have shown the existence of highly connected hub regions that play crucial roles in brain communication and the integration of information. Future applications of brain modeling and computation for understanding brain function and dysfunction will also be discussed. Overall, the new field of connectomics offers a unique opportunity for building a theoretical understanding of the function of the human brain. After receiving an undergraduate degree in biochemistry, Olaf Sporns earned a PhD in neuroscience at Rockefeller University and then conducted postdoctoral work at The Neurosciences Institute in New York and San Diego. Currently he is a Distinguished Professor in the Department of Psychological and Brain Sciences at Indiana University in Bloomington. His main research area is theoretical and computational neuroscience, with a focus on complex brain networks. He has authored over 160 peer-reviewed publications as well as the recent books "Networks of the Brain" and "Discovering the Human Connectome", both published by MIT Press. Sporns was awarded a John Simon Guggenheim Memorial Fellowship in 2011 and elected Fellow of the American Association for the Advancement of Science in 2013.